NORTH KOREAN LEADER Kim Jong-Un and US President Donald Trump will meet for the second time next week, following their historic summit in Singapore last year. The two leaders will hold talks in the Vietnamese capital Hanoi on 27 and 28 February, when they are expected to discuss details of a de-nuclearisation agreement. It marks the latest chapter in the pair’s colourful history, which has seen threats and name-calling give way to a more amicable relationship. Trump, who previously called Kim “Rocket Man” and threatened to meet his threats with “fire and fury”, said he has developed a “special bond” with the North Korean leader. Meanwhile, Kim – who bragged about his country’s nuclear capabilities and called the US President “a rogue and a gangster” – has said he is ready “leave the past behind”. 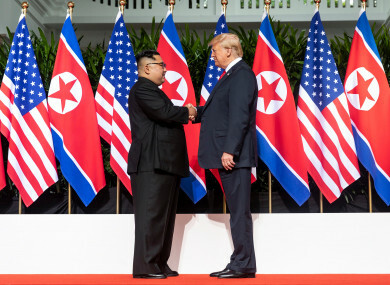 During their meeting last June, both leaders signed what was seen as a historic accord that would bring about the de-nuclearisation of the Korean peninsula in return for the lifting of sanctions. The US has since suspended some military exercises with South Korea, while North Korea has returned the remains of American soldiers who served in the Korean War. However, commentators have claimed that the nuclear agreement is vague, and does not include any deadlines or method of verifying whether North Korea is moving towards de-nuclearisation. Sanctions remain in place and it’s been suggested that North Korean nuclear sites are still in operation. Teams from both countries have already visited Vietnam to lay the groundwork for the summit, although officials have remained tight-lipped on their movements and meetings. US officials say next week’s meeting will be “similar in format to what we saw last June” and that there will be an opportunity for the two leaders to meet one-on-one. However, they have declined to speculate on what elements could be included in a joint statement that will be made at the end of the meeting. Trump, who considers himself a dealmaker, said this week that Kim would have to make a “meaningful” gesture on disarmament if he wants sanctions against North Korea lifted. Observers, meanwhile, say that more progress will be needed on last year’s vague promises. Trump could ask Kim to verify what North Korea has done to stop producing nuclear weapons and to provide a timeline to get rid of its existing arsenal. On the other side, Kim may try and win more concessions from the US by demanding Trump lifts sanctions against North Korea. Aside from nuclear discussion, it has also been suggested that there could be a formal agreement to finally end the Korean War (a ceasefire was signed in 1953 but the two countries are technically still at war). And on Tuesday, Japan’s prime minister Shinzo Abe said he would ask Trump to raise the issue of Japanese citizens abducted by North Korea with Kim. Abe has long sought to resolve the deeply emotive issue of Japanese nationals kidnapped by North Korean agents during the Cold War era. Trump said he discussed the issue of Japanese agents in his first meeting with Kim, so there may be more on the cards than the nuclear deal. Whether anything concrete is delivered this time, however, remains to be seen. Email “Donald Trump and Kim Jong Un will meet for the second time this week: here's what to expect”. Feedback on “Donald Trump and Kim Jong Un will meet for the second time this week: here's what to expect”.